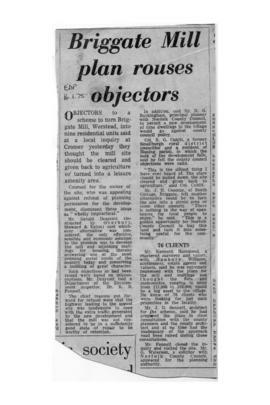 "Briggate Mill plan rouses objectors"
Cutting from the 'Eastern Daily Press' about protests at a local inquiry at Cromer into plans to build houses on the site of the former Griggate Mill. Note in 'The Daily Express' of a converted 300-year-old Norfolk windmill, up for sale as a week-end cottage. HESS catalogue #590. He called it "Honing " mill. 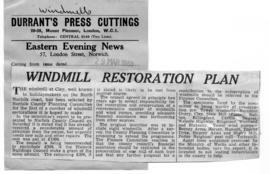 "Tower mill became an unusual five-storey home for a family"
Cutting from 'Eastern Daily Press' of an article by Rosemary Dixon describing the conversion of a Worstead tower mill into a house by Mr. David Robinson. The article also contains a brief history of the mill and its previous ownership.